I have wanted to make this for a few years now, and even attempted it a few times (before I got a Kitchen Aid Pasta attachment for my mixer), but never successful enough to blog it… today I did it!! I was so excited and nervous about trying this. But hey, I can make pasta! Who knew? Well, some of you are saying oh sure you can! But I had my doubts~ I learned what not to do next time too! I used the recipe that came with the Kitchen Aid booklet. You could substitute semolina for a portion (or all) of the flour if you wanted. I even made Ravioli with the pasta, but that is another blog post! 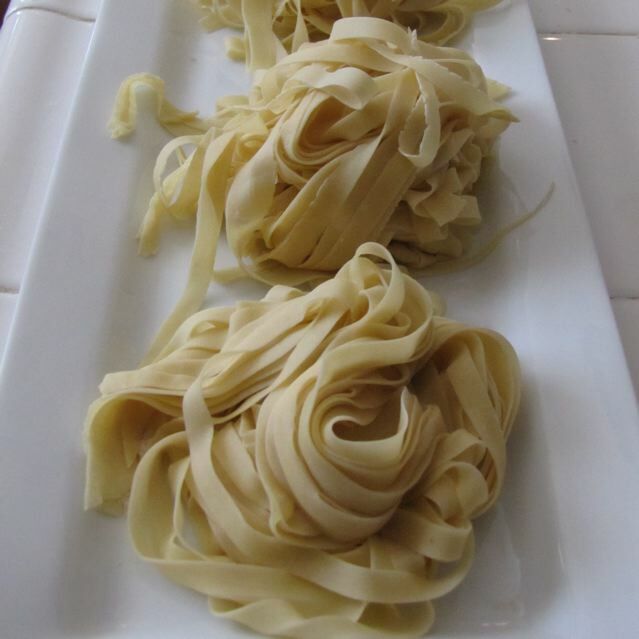 One key to making pasta is allowing the time to let it rest before you roll it out. The Kitchen Aid Pasta Attachment is a good investment if you plan on making your own pasta in the future. I do like being able to control what goes into my pasta (especially filled ones) – not only from a taste standpoint, but from a health standpoint – using ingredients I can pronounce… well most of them! The mixer does all the hard work and you are free to use both hands to feed the pasta through rather than having to crank with one hand on a manual pasta maker and only having one hand free to feed and catch- unless you have the assistance of an eager child. In the bowl of your Kitchen Aid Mixer, place the eggs, water, flour, and salt. Use the flat beater to beat the combination for about 1/2 a minute (level 2 power). Change the flat beater to the dough hook and continue to beat (level 2 on mixer) for about 2 minutes. Remove the dough from the bowl and knead by hand for a few more minutes. The dough will look pretty ragged still. Cut the dough into fourths and place a clean damp kitchen towel over the dough to prevent it from drying out. Rest the dough covered for at least 20 minutes. In this time you can make the filling if you are making Ravioli. Clear a large counter so you have room to work (I used the length of my island as I am lucky enough to have one). Make the pasta according to instructions on the machine. 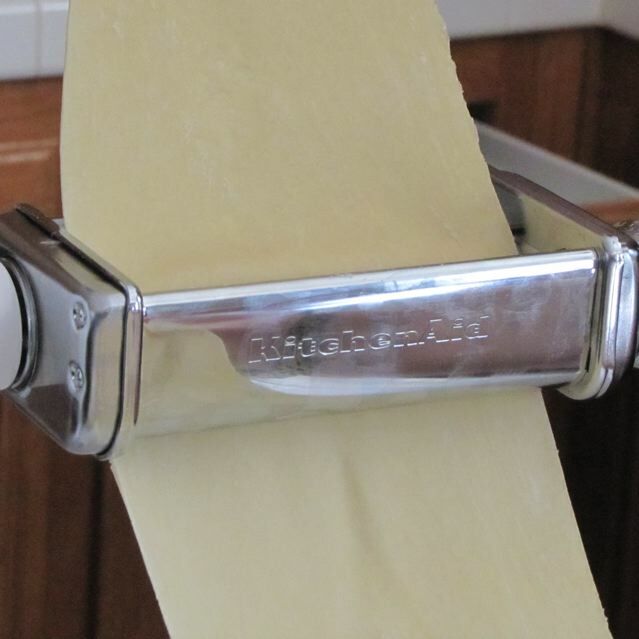 Start with the width of the pasta roller at 1 and feed one portion of the pasta through the roller. Fold the pasta into thirds, and feed through the machine again. Repeat about 3 times. After that it should be about the right shape for you. Increase the number on the pasta roller to 2 then three and so on feeding the pasta sheet through the machine after each adjustment. I stopped at number 7 for my ravioli, but could have gone 2 more notches for even thinner pasta. Use the pasta cutter attachments to make linguine or spaghetti. Categories: Main Dish, Main Dish - Pasta | Tags: Homemade Pasta, Kitchen Aid Pasta | Permalink.